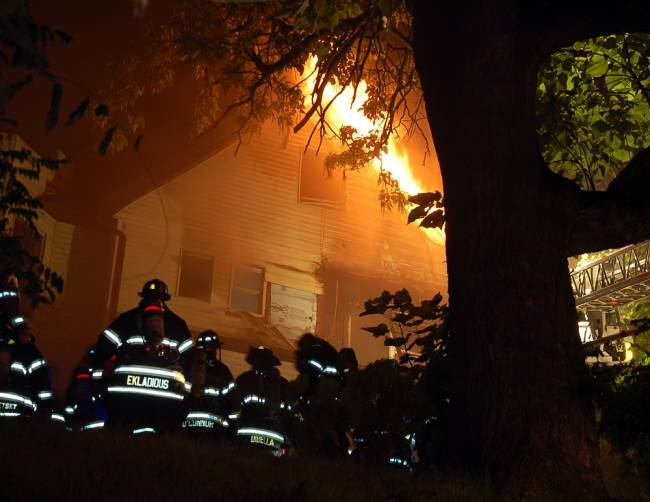 PASSAIC — City firefighters battled a three-alarm blaze on Westervelt Place early Sunday morning, rescuing one person who was trapped on the roof of the three-family house as it burned. The fire began shortly before 12:30 a.m. in the basement of 125 Westervelt Place, a wood-frame building, the Passaic Fire Department said. The fire spread up the interior walls of the house, creeping up the first, second and third floor of the home, authorities said. While en route to the scene, the department was told a female tenant of the building was trapped on the roof. When the department arrived, they found the woman on top of the building with smoke billowing around her. Unable to access the building directly from the street, the department brought a ladder to the side of the building to rescue her, Battalion Fire Chief Joseph Cajzer said. The building was set in from Westervelt Place and built on a slight hill, making it harder to access directly from the street, Cajzer said. Firefighter Ruperto Alfaro climbed the ladder and was able to save the woman who was trapped on top of the building, Cajzer said. It was later discovered the woman had climbed out of a third-story window to escape the growing fire. Cajzer said the cause of the fire was being investigated, but the blaze had spread to all three floors of the building. Six fire departments from Bergen and Passaic County responded to the scene. The fire was extinguished shortly after 4 a.m.
No tenants of the home were injured, Cajzer said, however two firefighters were transported to St. Mary’s Hospital in Passaic and St. Joseph’s Regional Medical Center in Paterson for smoke inhalation treatment. The American Red Cross said it was assisting 12 people displaced by the fire with temporary lodging and money to purchase food and clothing. Fire departments from Paterson, Wallington, Carlstadt, East Rutherford and Clifton assisted the Passaic department after calls for mutual aid, Cajzer said.